We headed to Newcastle recently for a fabulously stylish weekend. Our home for one of the nights was The Townhouse Hotel; a small boutique hotel in the upmarket suburb of Gosforth. Just a couple of minutes by car from the city centre; the smart terraced building sits on a quiet tree-lined street. We felt completely relaxed when we arrived and received the warm personal welcome that boutique hotels allow. The lobby is small and inviting, and has a small selection of local designer jewellery and accessories available for purchase. The decor is unique, and when we were told that the owners had designed each of the hotel's ten luxury rooms individually, we couldn't wait to see ours. We were at the top of this historic building, and with no lift, it would be a problem for anyone with mobility problems; but the climb was more than worth the wait when we had a peek at our little haven for the night. Our eyes were drawn immediately to the feature of the room- the gigantic under-window bath in the bedroom. High enough up from street level to protect from prying eyes, we enjoyed a relaxing bath in front of the TV after dinner. Our room had a purple opulent design, and an extremely comfortable bed that we didn't want to get out of when breakfast time arrived. We had a Full English breakfast, made fresh to order with locally-sourced ingredients. It was delicious, and set us up for the long drive home back to Glasgow. 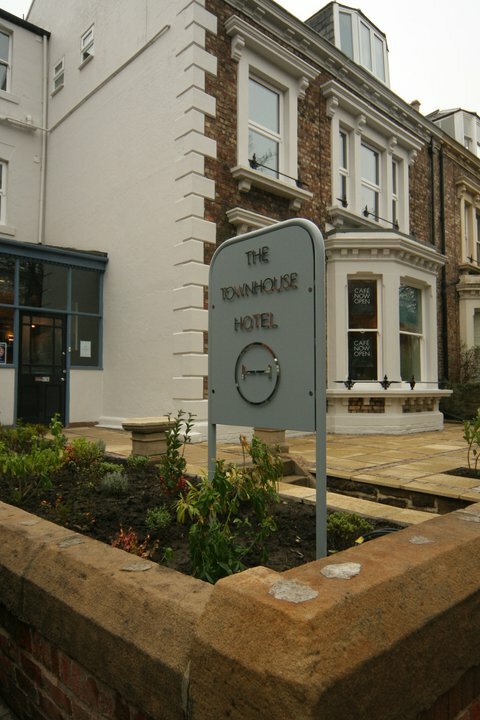 Rooms at The Townhouse Hotel start at £95 per night, and more information can be found at www.thetownhousehotel.co.uk. During our stay in Newcastle, we enjoyed dinner at the quayside at upmarket, yet relaxed, Italian restaurant Gusto. An array of twinkling fairy lights deck out the venue both inside and out, and its waterside location (with lit-up bridges) make it a spectacular place to eat at night. The menu at Gusto is so vast and varied that we spent a long time choosing. We finally settled on their Honey Baked Goat's Cheese Tart with Walnuts, Red Onion & Beetroot (£5.95). The flavours complimented each other wonderfully, and it was just the right size of portion to leave room for our chosen main course- the Rigatoni Primavera with Vegetables, Grand Padana, Pine Nuts, Cream and Mozzarella (£8.75). You can always tell how good a restaurant is by how they cook the most simplest of dishes, and this pasta dish was made to perfection with fresh al-dente vegetables and a light cream sauce. We'd heard all about the dessert we chose long before we even arrived at the restaurant. It has a bit of a following, and we were anticipating the treat since we arrived. Gusto's Nutella and Mascarpone Calzone (£5.95) is THE dessert to order. It is, in effect, a calzone pizza filled with copious amounts of chocolate hazelnut cream cheese, and it's to die for. The most perfect creation! To view Gusto's menu online and to make reservations, visit www.gustorestaurants.uk.com. All photography by Malcolm Smith unless otherwise stated.